Last night I was excited to take part in an exclusive bloggers' exclusive viewing for Motel Rocks Vintage. The night (and their weekend pop-up shop open to the public) was showcasing their line of one-off upcycled/reworked vintage pieces. 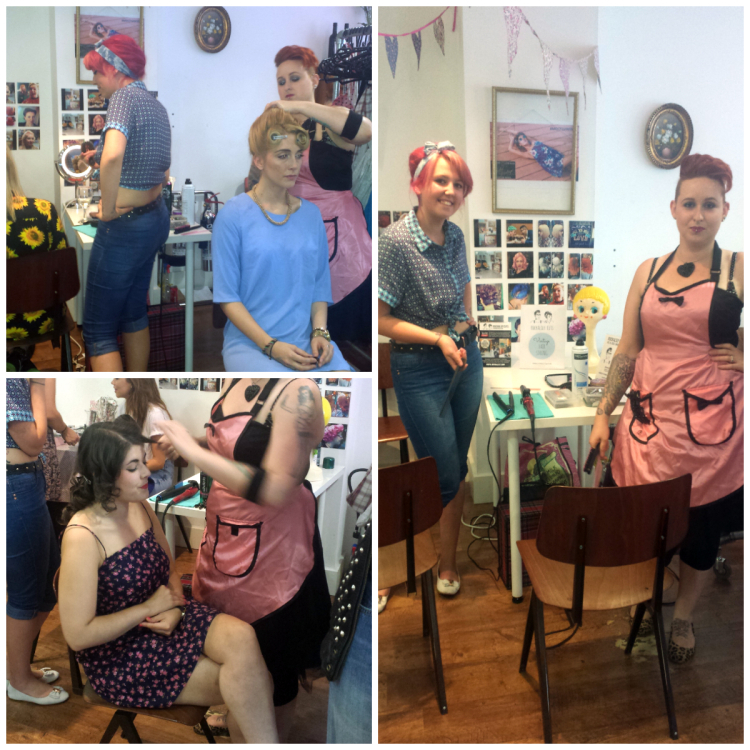 Rockalily Cuts was on hand to provide vintage hair styling for all the invited bloggers, creating looks from the 40s, 50s, 60s, and 70s. There was great music playing, drinks, and clothes to look at! What else do you need for a fun event? The Motel Rocks Vintage range was really great, and if I'm being honest I hadn't expected it to be! Whoops! I had presumed it would all focus on the fashion for the 80s and 90s, something which I'm not that into (I'll leave that to the younger ones!). However, I found quite a few pieces that I'd love to mix into my wardrobe. The upcycling is based around set shapes, so that there are lots of different fabrics to select from. I really liked this little checked cropped top, which would definitely look mid-century with a high waisted pencil skirt or cropped jeans. Their Gypsy Crop is £22. I'm obsessed with varisty jackets, and I found it very hard not to but one of these satin embroidered ones, as I've always wanted one. These were a bargain £45. There was also some other goodies to look at, The Vintage Cosmetic Company were applying lashes, and GoGo Philip let me model this bling-tastic gold necklace. It was so fabulous, and only £20. We had a ton of fun! If you want to go to the pop-up shop yourself, it is open today (31st July) and tomorrow (August 1st) at 71-73 Great Portland Street.